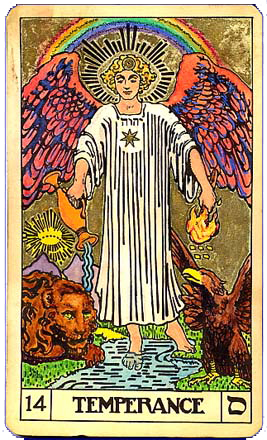 Temperance is the messenger of a simple spiritual truth. Offering concentration, creative energy, flexibility and adaptability as aids to direction. The sign of Sagittarius and the Temperance card represent the quest for higher knowledge. Ruled by Jupiter, it teaches the laws of verification, order and harmony. Though adjustments are necessary, trust, patience and acceptance are key to the outcome. Confer with Temperance to focus on a goal or to journey within to bring transformative self-knowledge to consciousness. Temperance image on journals, T-shirts, and mugs. Affirm: I Am an Open Channel for Creativity.